This article first appeared on East Niagara Post on March 31, 2015. It is repeated here as I work to put all my book reviews in one place. They will be posted on Thursdays or Fridays and only be altered from the original in that I will add publisher information and pages. Hopefully, by revisiting these reviews, other people might find a book they'd like to pick up for their own enjoyment. I have to admit that writing reviews for nonfiction books is not exactly my favorite thing to do. There is a lot of pressure to keep true to the historical accuracy. There is also the added pressure when the book is a memoir, especially when it’s of someone you admire. I had a bit of that issue with You Can’t Make This Up by Al Michaels. Which may be why this will likely be one of the shortest reviews I have written. I am a big fan of Al Michaels. My earliest clear memory of the announcer was during the 1989 World Series when the earthquake struck San Francisco. Sure, he’s well known for the Miracle on Ice call during the 1980 Winter Olympics, but I can’t quite recall that because I was so young. He also called the 1991 Super Bowl when the Bills lost a squeaker to the New York Giants. He has been the announcer for my most formative years of watching sports. When I saw the book on the shelf at the library, I knew I had to grab it and give it a thorough read. I could tell from the end of the first chapter that this book was not what I expected. Typically, a memoir would talk about their lives a bit more than Al does. Rather, he barely touches upon his early life and instead gives us snapshots of the growth of his broadcasting career. First off, let me tell you that this book gives the general public a unique look at some pretty well known events in the sporting world. From his seat at Lake Placid in 1980 to his friendship with O.J Simpson, Al Michaels gives us a behind the scenes look, and makes it interesting. Additionally, Michaels explains the sometimes complicated relationships with his fellow sportscasters. We learn that the beloved Howard Cosell was a cantankerous old man at the end of his career who drank his friends and colleagues away. We get an inside look at the aloofness of Frank Gifford, and the high praises Michaels gives Dennis Miller and Chris Collingsworth. Al Michaels is a man who is living his dream. Ever since he was a child, he would set up the neighborhood games and announce the action. From high school, through college, Michaels emulated his heroes as he described the action to listeners everywhere, eventually working alongside those very heroes. Michaels rehashes his history of announcing with great colloquial prose. His writing, with help from a ghost writer, is easy to read, and engaging to the reader, where said reader is pulled into events that seem so familiar. Michaels reinforces the idea that he is one of our friends ready to share in joy and anguish of the gladiatorial barrage of our favorite teams. When I first picked up the book, I had already heard about the book. 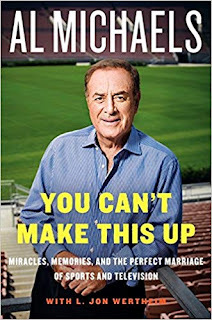 It was described as a fantastic book detailing the life of Al Michaels. It was said to give his life story the public showing that it deserved. I went in expecting exactly that. It was not what I got from the book. You Can’t Make This Up was not the life story of Al Michaels. It was a group of snapshots extending over a long career in the broadcast booth. And it was fascinating. While I wish there was more of Michaels’s life outside the booth, the stories contained were thrilling and engaging. If you get a chance to grab this book from the library, I highly suggest taking the time to read it. We already like Al Michaels. This book gives us a chance to like him a little bit more. While I have steered away from reviewing nonfiction books, there will be several upcoming. There will be one about Bob Dylan and another which may barely qualify as nonfiction. It is much harder to write these reviews than writing reviews for fiction books, but I will endeavor to give it my best shot. I hope you will still enjoy them as much as the fiction reviews. Stay tuned. We’ll be charting some new territory. Craig Bacon has a face for radio and a voice for ASL interpreting. But he still tries.